We all use Facebook for sharing photos and videos. Our friends also upload our photos and tag us in their album. Most of the people use Facebook to store and share their photos. Most of the times, we do not have those photos which our friends upload. So, what if you want to download all those photos in your system. Facebook has easy option to Download your own photos, but downloading photos uploaded by your friends is not easy. You will have to go to photos and save individually. But this process can be simplified with Pick&Zip service. It lets users download photos from Facebook. It also lets users to download photos of your friends, pages and groups. Pick&Zip is a nice web application that lets you download tagged photos even you have not uploaded them yourself. Visit the Pick&Zip and then login with your Facebook account. It will ask permission to access your profile. In few seconds, it will show your Facebook photos of your friends, pages or groups. 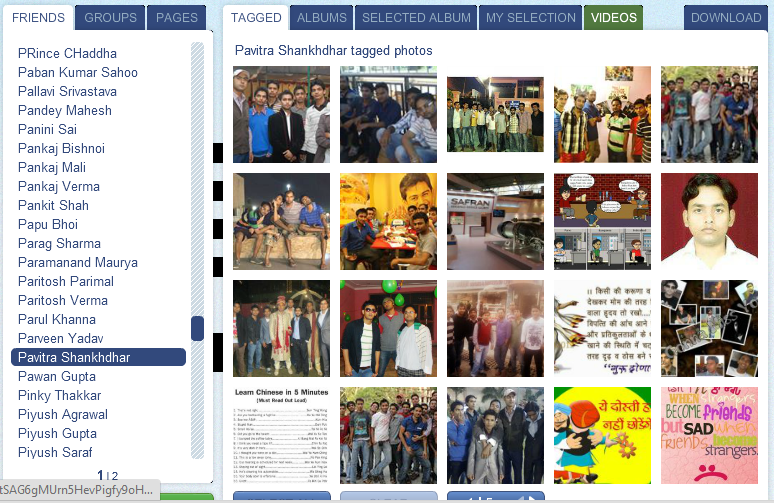 From the left side, select friend, page or group and then select photos from their album. You can select photos of any of your friends from the list. Select all photos which you want to download and then click on download tab at top-right side. Here, it gives you two options. either download selected photos or all photos. Note: Interesting thing is that you can download all photos of your Facebook friends. It may be a privacy concern. Then select format to download photos. Select either ZIP or PDF format. I tried this tool and got success in downloading photos of my friends. This is really interesting tool as it lets us download photos of our friends and pages too. Try the tool and share your views with us via comments.